Ashton tracks three famous Victorians during the steamy months of May through August, in her book One Hot Summer: Dickens, Darwin, Disraeli, and the Great Stink of 1858. That year, marital mores and public sanitation were the talk of the town. In a city confronting an inescapable environmental disaster, it was a time of disregard for good science. London was on a knife's edge between modernity and medieval Britain. The world's largest ocean liner had been built, but no ports were big enough for it. Darwin was about to publish his theory of evolution, but was afraid of the reaction from religious groups. A few years earlier, physician John Snow had discovered that waterborne germs could cause cholera, but many doubted his findings. He died in 1858. The future was on the horizon, but London was still stuck in the past — and Ashton says that's why she chose to focus so specifically on the summer of 1858. At that time, unfortunately, as a matter of sanitary reform, the effluent of the two million inhabitants of London was being directly pitched into the Thames through the rainwater drains. And the Thames flowed up and down, back and forth, and never got rid of its toxic load. Meanwhile, drinking water was being hauled out of the Thames at the other end. And so of course disease was rife, the smell was impossible, and something had to be done. The newspapers in particular really got on the case of Parliament. Beforehand everything had been collected by night soil men, who then took the stuff out to the countryside and gave it to the farmers to put on their fields. But the population of London had doubled in 50 years ... so it all became quite impossible. But finally, in the summer of 1858, Parliament got its act together and passed the Thames Purification Bill which then let the rather wonderful, innovative engineer Joseph Bazalgette take the sewage in intercepting sewers right out of London. Dickens feared for half a moment in that summer that his wife might try to divorce him on the grounds of adultery with her sister. ... He escaped the heat — in both senses — in July, August 1858 and went off on a very successful reading tour. There's the famous moment ... when, on the 30th of June, a valiant committee of MPs, members of Parliament, had to rush from its committee room with handkerchiefs pressed to their noses. 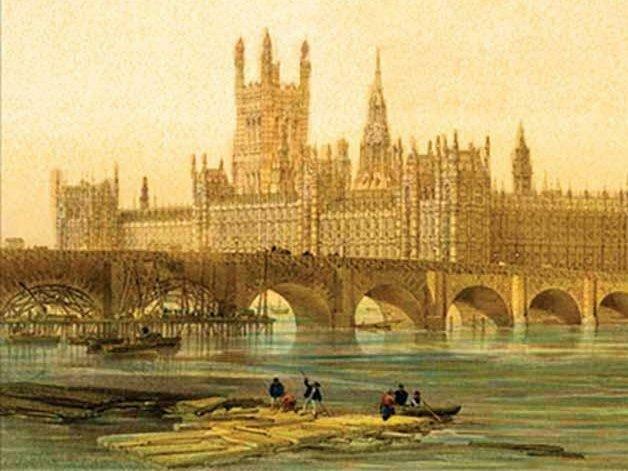 Because of course the Thames was washing to and fro along the walls of the houses of Parliament. And of course the newspapers [said] with glee: Serves them right! ... They finally have to do something because they can't do their job with this stink going on underneath their collective nose. Darwin had been working on [his theory] for 20 years, but was very anxious to keep on getting more and more evidence and not to rush into publication — partly because he knew that religious figures would get upset, and his wife was devout and he was very anxious not to upset her. But what it did do was it galvanized him — because instead of him taking another four to five years and writing a book four or five times as long as [On the] Origin of Species he was fortunately forced into getting on with it and finishing it in one fairly brief volume and publishing it in 1859. So 1858 really is a kind of cradle for that. James Delahoussaye, Lee Mengistu and Emily Kopp produced and edited the audio of this interview. Beth Novey adapted it for the Web. Just in time for these hot days of summer, British historian Rosemary Ashton has written the history of one very hot summer in London many years ago, in 1858. That year, the talk of the town was all about marital mores and public sanitation. In a city confronting an inescapable environmental disaster, it was a time of disregard for good science. And it was a momentous year for three famous Victorians whom Ashton follows through the steamy months May through August 1858. The book is called "One Hot Summer: Dickens, Darwin, Disraeli, And The Great Stink Of 1858." Professor Ashton, thanks for joining us. ROSEMARY ASHTON: It's my pleasure. SIEGEL: First, the heat. How hot was it in the summer of 1858? ASHTON: Well, hot by British standards, I would say. It was continuously hot for two to three months with temperatures up into the 90s quite often. And the hottest recorded day up to that point in history was the 16 of June 1858, when the temperature reached 94.5 degrees Fahrenheit in the shade apparently. SIEGEL: And of course, there was no - there were no electric fans to help cool one off, certainly no air conditioning. ASHTON: Certainly not. That's right. SIEGEL: Now, the environmental disaster that assaulted the nostrils of Londoners in the summer of 1858 was in the River Thames. Explain what happened. ASHTON: Yes. We are dealing with a very hot summer at the moment, actually, and it's quite uncomfortable at times. But we do not have a stink coming from our major river, which runs right through the middle of London. But at that time, unfortunately, as a matter of sanitary reform, the effluent of the 2 million inhabitants of London was being directly pitched into the Thames through the drains, rainwater drains. And the Thames flowed up and down, back and forth, and never got rid of its toxic load. And meanwhile, drinking water was being hauled out of the Thames at the other end. And so, of course, disease was rife. The smell was impossible. And something had to be done. And the newspapers in particular really got on the case of Parliament. You're doing nothing. What are you going to do? For goodness sake, decide what to do and get on with it. SIEGEL: And this had been the result of a well-intentioned reform to install a great many WCs, or great many water closets or toilets, in London. ASHTON: That's correct because beforehand everything had been collected by night soil men, who then took the stuff out to the countryside and gave it to the farmers to put on their fields. But the population of London had doubled in 50 years from the beginning of the century, and so it all became quite impossible. But finally, in the summer of 1858, Parliament got its act together and passed the Thames Purification Bill which then let the rather wonderful, innovative engineer Joseph Bazalgette take the sewage in intersecting sewers right out of London. SIEGEL: As I read in your book, what people in 1858 were reading about in the newspapers, in addition to it being very hot and there being a smell, was divorce and adultery and marital discord. First, explain why that was so much in the papers at that time. ASHTON: Well, the previous year, 1857, Parliament had after many years of trying passed a divorce act which made divorce somewhat easier than it had been before. Divorce before the 1857 act was well nigh impossible unless you had a great deal of time and money on your side. And of course, for women it was actually not possible at all. It was during our hot summer that some of the most interesting and difficult cases came to the court, to the new divorce court. And of course, this was avidly followed by the reading public, and also by some of my famous people because Dickens feared for half a moment in that summer that his wife might try to divorce him on the grounds of adultery with her sister. SIEGEL: Did Dickens actually come close to giving up writing novels in that year, in 1858? He devoted himself to a new - he had a new career which was publicly acting out his novels, becoming a public speaker. ASHTON: Yes, he did that. And he certainly - for the first year since he started writing novels, he was writing no novel at all during the whole of 1858. But what he did do was he escaped the heat in both senses in July, August 1858 and went off on a very successful reading tour. And he went night after night, day after day. He gave performances from his novels, which he really acted out in every way. And of course, he later came and did the same thing in America. SIEGEL: For you it seems the heat and the stench were what these literary, scientific and political circles of London in 1858 that you're writing about - this is what they all had in common. They were all inhabiting this environment. And from time to time, they remark on the discomfort they're experiencing. ASHTON: Yes, they do, Disraeli a lot because he's the one that's trying to get the act through which will actually do something about the stink. And of course, there's the famous moment - very famous in sanitation history, I suppose - when on the 30 of June a valiant committee of MPs, members of Parliament, had to rush from its committee room with handkerchiefs pressed to their noses because, of course, the Thames was washing to and fro along the walls of the Houses of Parliament. And of course, the newspapers took this up with glee - serves them right. If they won't do anything, they'll finally have to do something because they can't do their job with this stink going on underneath their collective nose. SIEGEL: It seems that in 1858 in London you've found a moment that's kind of on a knife's edge between modernity and medieval Britain. The world's biggest ocean liner has been built, but it's so big it can barely get out of the Thames and there are no ports big enough for it. Darwin's about to publish his theory of evolution, but he's very reluctant to do it because he's afraid of what the reaction from religious people will be to it. Dr. John Snow had discovered a few years earlier that waterborne germs could cause cholera, but no one accepted his findings. So there's a great deal of the future that we see on the horizon at least and the world isn't quite ready for it yet. London is still stuck in the past, it seems. ASHTON: That's right. And that's actually why I chose the year 1858 or the summer of that year. If you look very closely, close and deep, really, at a short period of time in 1858, you hear Darwin - I mean, his great shock then was that he got a letter from his fellow naturalist, Alfred Russel Wallace, who was out in the field working away in the Malay Archipelago. And there in eight pages is Darwin's own theory of evolution by natural selection, which was the very mechanism that Darwin was - had found. And Darwin had been working on it for 20 years but was very anxious to keep on getting more and more evidence and not to rush into publication partly because he knew that religious figures would get upset. And his wife was devout, and he was very anxious not to upset her. But what it did do was it galvanized him because instead of him taking another four or five years and writing a book four or five times as long as "Origin Of Species," he was fortunately forced into getting on with it and finishing it in one fairly brief volume and publishing it in 1859. So 1858 really is kind of the cradle for that. SIEGEL: Rosemary Ashton, author of "One Hot Summer: Dickens, Darwin, Disraeli, And The Great Stink Of 1858." Thank you. (SOUNDBITE OF FUNKADELIC SONG, "CAN YOU GET TO THAT") Transcript provided by NPR, Copyright NPR.